SHANGHAI (Reuters) – A shipyard in China’s southeast has suspended operations after at least 500 farmers, who blame water pollution from the yard for killing their abalone harvest, stormed the yard and smashed its offices, an official at the shipyard said on Tuesday. 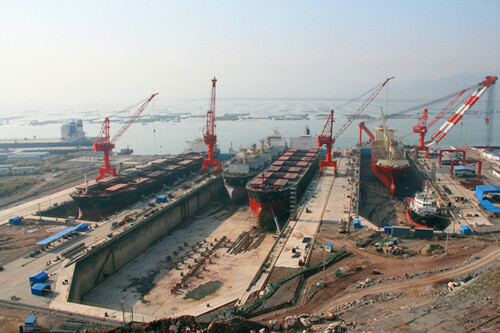 There has been no work at the Fujian Huadong Shipyard, which sits on the north coast of Luoyuan Bay in Fujian province, since last Wednesday, said an assistant manager at the factory who gave only his surname, Zhang. Luoyuan Bay is home to numerous floating farms that cultivate the sought-after shellfish, a delicacy that is eaten in Asia at banquets and even exchanged as gifts. Public awareness over China’s industrial pollution has grown in recent years and Chinese leaders have vowed to clean up its waterways and skies. However, violent protests over such incidents in China are comparatively rare. Sixteen people were sentenced to prison last year for their involvement in an environmental protest. Zhang said farmers from surrounding villages visited the offices of the Luoyuan Bay area Communist Party committee after an unusually high number of abalone deaths in August. Villagers decided to target the shipyard directly after they received no reply to their petition, Zhang said. “On the 16th (last Tuesday) some villagers cornered one of our bosses and wouldn’t let him leave, they wouldn’t let him drink or eat,” Zhang said. “There were at least 500 villagers who arrived the next day,” he said. “After work at the yard stopped, they entered the locked offices of our finance and administrative departments and smashed the computers, cupboards … They left after they got tired,” Zhang said. Media reports said the villagers blamed the factory for polluting the water in which the abalone was farmed. A Luoyuan government official said they had sent a team to investigate. The factory, which opened in 2011, switched its focus to ship repair last year after the global shipping slump sapped demand for new vessels, Zhang said. Ship repair usually has a greater impact on the environment, he said, but the reasons for the abalone deaths were likely to be more complex. He said the factory was waiting for the local government to give the go-ahead before restarting work.